I travel a decent amount and when you’re on the go, it’s important to have information you need handy. That’s why I use a variety of apps to make the process easier. My smartphone of choice is a Samsung Galaxy S4 (Android) but all the apps below are also available on iOS for the iPhone aficionados. TripIt prides itself in being the “All-in-One Travel Organizer” and it really is. TripIt is like a personal assistant when you’re traveling. First of all, it scans your email of choice for travel itineraries, hotel confirmations or ticket details and it automatically pulls all of it into the software. Once it does that, it tracks the trip(s) for you. On the day of your flight, you can get notification of any changes or delays. Every time one of my flights is delayed, I get a text from TripIt before I get it from the airline itself. No joke. THAT is one of the reasons why my love for the app went deep. If your flight is cancelled, TripIt will show you alternate flights you can take. The app also keeps the running list of trips you’ve taken and gives you a snapshot of your traveling habits. How many total miles have you traveled? How many countries? I liked TripIt so much that I paid for the Pro, which is $49 a year. More than worth it for me. This app is available for iPhone, iPad, BlackBerry and Windows phones. For those of us who travel more than once a month, this is a must-have app. TripAdvisor wants to help you “plan your perfect trip” and is basically travel Yelp! The reviews on that site about hotels, flights, restaurants and other places you can go when you’re visiting a city are priceless. PRICELESS! They have detailed reviews from people who’ve frequented wherever you want to go and it allows you to make an informed decision so you’re more comfortable with your choice. When I was planning my next vacation, I cross-checked EVERY hotel or city I was considering using TripAdvisor. What’s great about the site and app is that the reviews are tied to real people. And because it’s become a trusted source, it is in the best interest of hotels and all these other places to give consumers a really good experience. If you have below 3 stars on TripAdvisor, your business will suffer. So stay on your Ps and Qs. HotelTonight does exactly what the name implies: it helps you get a hotel room for the night. If you find yourself in a city and you need accommodations (because ish happens), this app will scour what’s available and try to find you the best deal. I was in this situation in January when I went to Las Vegas. The temperature in Chicago dipped to -35 degrees so no planes were flying in and out of the city. My flight out of Vegas was cancelled and I was gonna be spending 2 extra days in Sin City. It’s all fun and games until you realize that you might be homeless if you don’t wanna pay beaucoup bucks for a place to lay your head. So I used HotelTonight and found a room for $75. WHOOT! The app shows you the ratings of the hotel too so you know what you’re getting into. It’s hella useful and when life throws you lemons when you’re on the road, HotelTonight will help you find a place to lay your burdens down for just that night. I’ve been using Kayak for years and what I love most is its forecasting feature. When you’re looking for flights and you search Kayak, it’ll tell you whether to BUY or WAIT, based on its ability to track the trends of airfare. I take its advice too. I’m also here for the alerts feature, which can send you emails daily or weekly on ticket prices. The site also allows you to do multi-city itineraries pretty easily. I’m a fan! Good ol’ Priceline is still in my top 5 travel apps. You can book flights, hotels, packages and all that good stuff on there. But what I like the most is their “Name Your Price” feature. “Name Your Price” allows you to put in a blind bid for hotels and flights, getting you 40-60% off the full price. If you’re looking for a hotel in a city that you’re visiting, you tell Priceline what area in that city you want and what number of stars you want your accommodations. It’ll recommend a price based on the average in the area and you put in what you want to pay. Priceline searches and it will either decline or accept your bid. You can re-bid if it declines, but something has to change about your search (either neighborhood or star level). You won’t know what hotel you get until it’s accepted your bid. That’s the risk. But if you pick a 3-star hotel, then you will be getting one of like a handful of choices. There’s ways to know you won’t end up in a motel. For “Name Your Price” flights, those are best if your travel schedule is flexible because you won’t know the time of your flight until the system accepts your bid. So it could be 6am or it could be 10pm or anything in between. So let’s say you have to be somewhere by Friday at 9am. If you do “Name your price” you would bid for Thursday. Makes sense? I’ve used it many times and sometimes I had the jackpot and it gives me my airline of choice and a decent time. Other times, I’ve had to drag myself up at the crack of dawn. It’s a gamble but sometimes the savings are worth it. 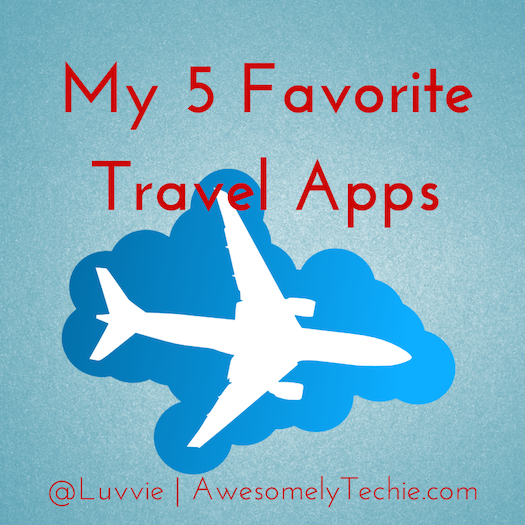 So those are my top 5 fave travel apps. All of them are available in the Google Play Store and the Apple Store. What are your fave travel apps? Do you use any of these?